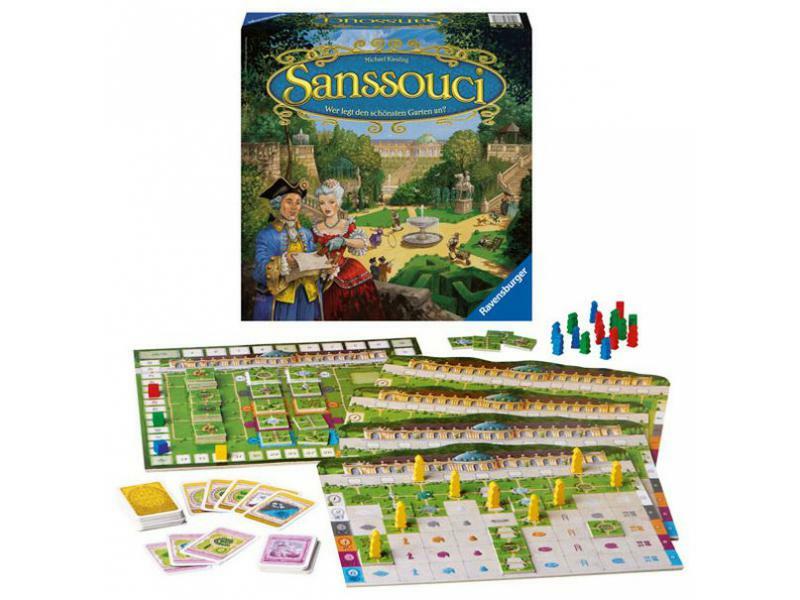 Game Idea – Over the course of 18 rounds, players are trying to construct the best garden on the board in front of them. The garden board has 9 columns, each with its own identifying landmark (trellis, fountain, statue, etc) and each of these columns is six rows deep. At the top of each column stands a noble. 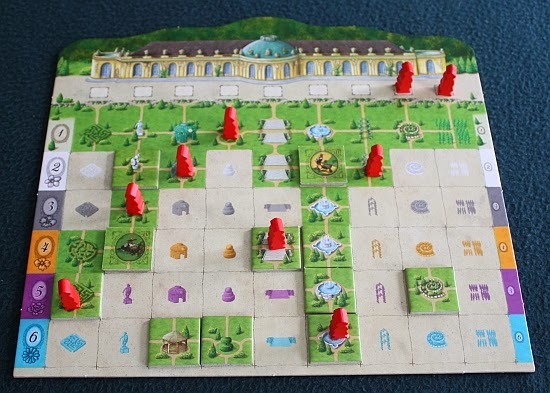 During the game, these nobles will march downwards (on played tiles) to score you points. Tiles are placed on a 5×2 grid – two tiles available on spaces of each of five different colors. Players have a hand made up of 2 cards. These cards show either a pair of colors OR a specific garden landmark. On your turn, you play one of the two cards from your hand and then you choose a tile that matches the characteristics from the card played. If you play a colored card, you choose from one of the four tiles that is lying on a space of matching color. If it is a landmark card, you take a tile with that symbol on it – from any row on the board. If there are no tiles that match the symbol, then you can take any tile from the display. Once you have chosen a tile, you then immediately play it into your garden. The rules for this are fairly easy. In general, there is a spot on the board for each tile selected – the combination of the symbol on the tile and the color of row that it was chosen from the supply. If this space is free on your board, the tile automatically goes on that space. If that space is already taken, then you turn the tile over and place it anywhere in the same row or column as the preferred space. This tile will show a gardener instead of the usual symbol. Once you have placed a tile, you can move one of your nobles. They must travel over already placed tiles (or the preprinted uppermost row on your board). The noble must end the movement in the same column that it started in (though they can move laterally in the midst of movement), and it must end up lower on the board than it started. Importantly, the noble may not END its movement on a Gardener tile – it must stop on a regular garden symbol. Wherever the noble stops, you score points equal to the row where it ends its movement (between 1 and 6 points). Finally, you reset your hand (by drawing one more card from the deck to bring your total up to two) and by replenishing the supply by putting a randomly drawn tile in the space where you just took one. The next player then takes his/her turn. This continues on until all players have used all 18 of their cards to select and place tiles. At the end of the game, there is a small bonus scoring round. First, for every completed horizontal row, you score (10 minus the value of the row) in VPs. Then, for each completed column, you score 5 points. Finally, each player has a mission card (chosen from two randomly dealt at the start of the game) which shows two different garden symbols. You score points equal to the place of your noble is each of those two columns. The winner is the player with the most points. There is also an expansion included with the game which is a 16-square pyramid which is placed on top of your garden board prior to the start of the game. There are some different spots on this board which can alter your score. A few of the spaces give a bonus 1 to 3 points if the matching symbol tile is placed on a spot. There are also four spaces which give 3 points if you are able to place a gardner on those spots. Finally, there are a few spots which give minus points if a tile is placed on them at all. I really like this one. It has been a good entry-level game for friends who aren’t into regular gaming but it is still meaty enough to keep my game group interested as well – and as a result, this is a game that hits my sweet spot. In the past year, I have definitely gravitated more to the lighter side of the games spectrum. I love the tile choosing/placement mechanic. On most turns, there are usually a number of tiles from the supply of ten that are useful, and you have to figure out what is best for you at that moment, also trying to account for which tiles would help your opponents out. There are a few times when the small hand size makes it difficult to find an awesome tile to play, but this should even out over the length of the game. The game doesn’t clump up because players are often looking for different things – due to different setup positions as well as different goals. Each board has a few different spaces pre-printed on the board. Most tiles have some value to a player – either in the short term with noble scoring or in the long term by helping fulfill one of the three end-game bonus scorings. Decisions can get tough in midgame as you have to balance your desire to score points now (moving your Nobles) versus setting up endgame bonuses. I’ve only played the expansion once, and to be honest, I prefer the base version. I find that the extra scoring options in the expansion only serve to slow down the game. It seems simpler and elegant just to leave that option out for me. Joe Huber (played once) – This is a pleasant game – I wouldn’t turn down a play if others wanted to play it. But – there’s not a huge amount of control here. I spent more than half of the game looking for a tile I could flip, so that I could complete a row or column – but due to bad luck I never saw one. Which is fine – but moving nobles through a garden isn’t a sufficiently captivating theme as to bring me back to the game. Jonathan Franklin (played ones) – Most of the game is ‘fine’ as in a neutral rating, but much of the game is moving your nobles, not just end game scoring. Although your nobles have to stay in the same line, they can move off their line so long as they end up back where they belong. Sometimes a tile will appear to be totally useless, but end up completing a circuitous path to get a noble to a high scoring position. I enjoyed those moments of realization enough to make it a ‘like it’ for me. Also, the game does not outstay its welcome for its weight, so if you are not keen on it, it will be over quite soon. Another aspect in its favor is that there are not many games to compare it to, which is something I look for in a game. Jennifer Geske (played once) – I only played the basic game once. Even with only 2 players, it can be frustrating if the tiles you want do not show up at the right time (I can only imagine that the lack of control is more pronounced with more players). 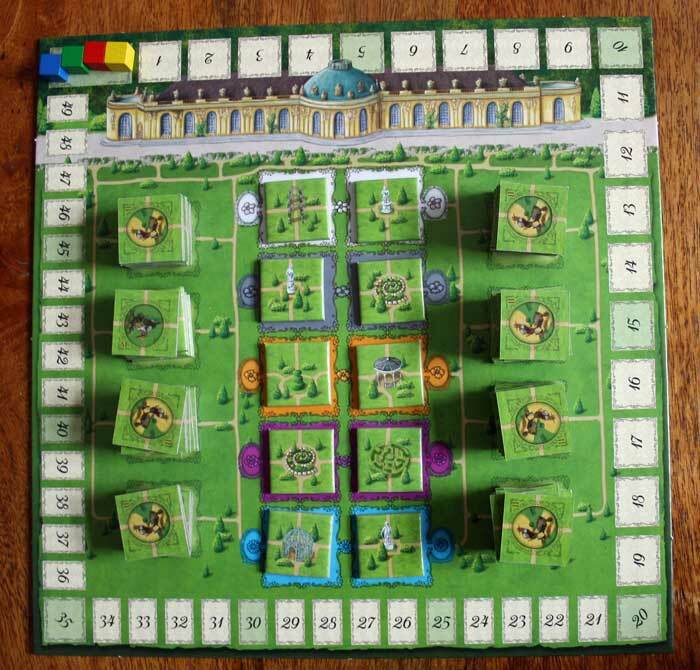 However, with a more relaxed attitude (going along with the pleasant ‘taking a stroll in the garden’ theme), making the best tactical decision with what is available at the time allows for more options as the game progresses. The clever part about the game is setting yourself up so you can take advantage of multiple options later. The base game is light and enjoyable. I would like to play with the advanced/variant rules but that would require me to first track down a copy of the game. I had a complaint that was similar to my problem with Baltimore & Ohio. This game often gives you choices about how far down to move your meeple. You get more right away by moving far, but you risk not being able to move it at all. This forces you to speculate, and I don’t deny that there’s skill involved, but I hate this sort of thing. Similarly, in B&O, you have control over how much to pay out, but if you can’t increase your payout every time, you fail to gain stock value. 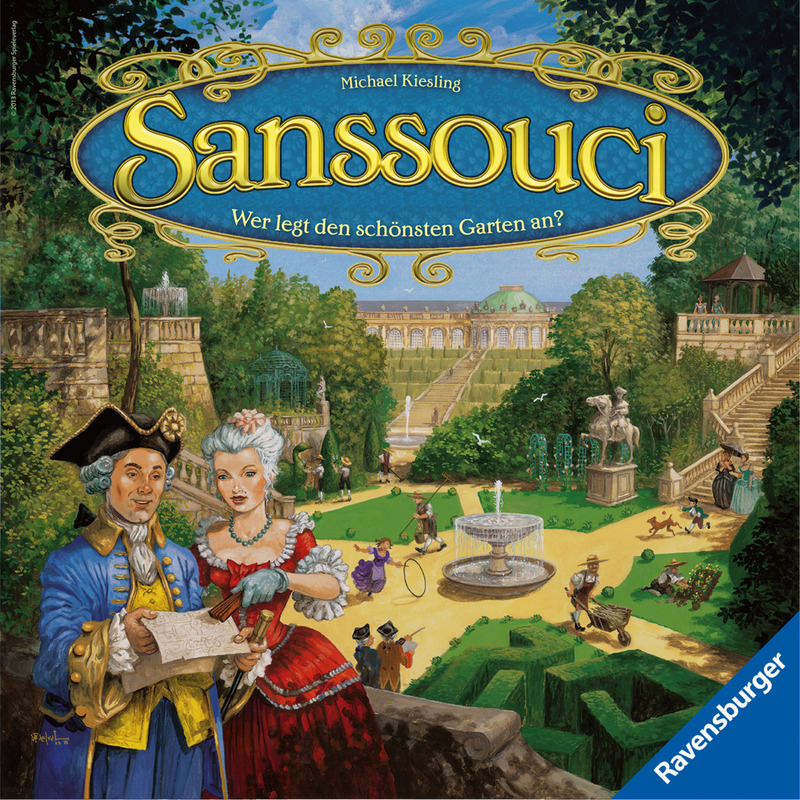 I really disliked Sanssouci.